The 7-5/8 inch tall MEGO TYPE 1 "skinny" male body (head to toe measurement) has a non-muscular torso, a pelvis, & slender jointed arms & legs. All points of articulation are held together with metal rivets. The wrist joints on the T1's are somewhat large, making the figure's wrist and hands look a bit long. One THIN white elastic cord strung through the arms, legs, torso, and pelvis hold these figures together. Information adapted from Darklord's body type List. 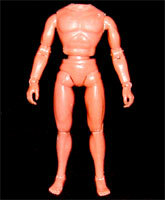 The 7-3/4 inch tall MEGO TYPE 2 "heroic" male body (head to toe measurement) has a barrel-chested muscular torso, a pelvis, and slightly more muscular jointed arms and legs than its Type 1 predecessor. Gone are the bulky metal rivets of the T1's - Type 2 figures feature smaller (more aesthetic), plastic pins at all articulation points. T2's are strung together with two THICK elastic bands, cris-crossed through the torso and pelvis connecting each arm to the opposite leg with small metal hooks. The 7-1/2 inch tall MEGO TYPE 1 "fat" male body (head to toe measurement) consists of a pot-bellied torso, with the same metal-studded arms & legs as the T1 male standard "skinny" body. The T1 fat body has no separate pelvis-the legs simply extend from two holes at the bottom of the big round belly. Consequently, there is no waist articulation for the MEGO fat male. As with the T1 skinny male, the T1 fat male is held together by the single thin white elastic cord running through all of its limbs. The 7-1/2 inch tall MEGO TYPE 2A "fat" male body (head to toe masurement) consists of a pot-bellied torso, with the same plastic-pinned arms & legs used on the T2 male standard body. Like its Type 1 predecessor, the T2 fat body has no separate pelvis-the legs simply extend from two holes at the bottom of the big round belly. 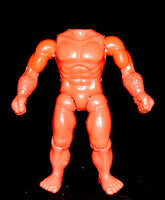 Consequently, there is no waist articulation for the MEGO fat male. As with the T2 standard male body, the T2 fat male is strung together with two thick elastic bands, cris-crossed through the torso and pelvis to connecting each arm to the opposite leg with small metal hooks. The 7-3/4 inch tall MEGO TYPE 2B "fat" male body (Head to toe measurement) has the same plastic-pinned arms and legs as both the standard T2 and the fat T2A male body, but the torso sculpt is different. Like the fat 2A, there is no waist articulation, however the 2B torso has a distinct pelvis section as part of its sculpt. This makes the overall height of a 2B slightly taller than a 2A-yep, this fat body is about the same height as a male standard body. As with the T2 standard male, and the 2A fat male, the 2B fat male is held together by a pair of thick elastic bands that run cris-cross through the torso & pelvis, connecting arms to legs diagonally with small metal hooks. The 7 inch tall MEGO "Muscle" male body (Head to toe measurement) has an extra-beefy torso with large arms and legs, thick with bulging musculature. All muscle bodies are articulated with plastic pins (no metal rivet versions). The torso and pelvis are one piece, so there is no waist articulation. Neither does the muscle body feature wrist nor ankle joints. But what it lacks in height & articulation, this body makes up for in sheer bulk! The body's hands are sculpted into huge clutched fists and its feet are sculpted extra wide and long-even the toes look strong! Like all T2 style bodies, muscle bodys are held together by a pair of thick elastic bands that run cris-cross through the torso, connecting arms to legs diagonally with small metal hooks. 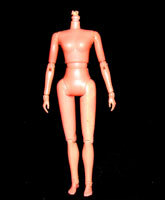 The 7-1/2 inch tall MEGO female body (Head to toe measurement) consists of a neck, torso, abdomen, pelvis, arms & legs-all sculpted to represent an athletic female form. The arms and legs are slender and sleek, and the hands and feet are small and delicate. Shoulders & Legs fit into the body 'ball-&-socket' style and elbows, wrists, knees & ankles are jointed with plastic pins. Female T1's are strung together with two thick elastic bands-one runs centrally, connecting the neck to a post on the inside of the pelvis, the other connects one arm to the other. This MEGO female body type boasts TWO additional articulation points over its MEGO male counterpart. 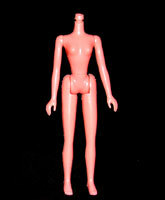 The 7-1/2 inch tall MEGO female body (Head to toe measurement) is configured similarly to the female type 1. Unlike the T1, the T2 arms are not articulated. They are one-piece, and more 'rubbery' than most Mego body plastic, designed to look more like Barbie arms. Visually, nothing else is different from the female T1's, although the new arms change the body construction slightly; the T2 torso's arm sockets are 'tongue-&-groove' rather than 'ball-&-socket', and the arms do not require elastic to hold them in. 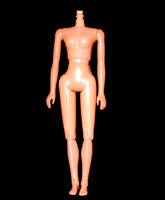 The 7-3/8 inch tall MEGO female body (Head to toe measurement) consists of a torso, pelvis,arms & legs. The T3 body features the LEAST amount of articulation for Mego figures in this scale. This female has both non-articulated 'Barbie-style' arms AND legs. The body consists of a one-piece neck/torso made to accommodate the new soft plastic limbs, connected with a swivel joint to the pelvis. This body has no elastic bands. The arms & legs both move only at the shoulders & hips. *NOTE: The only Mego figure known to be given this body type is Dukes of Hazzard Daisy Duke. In fact, rather than the typical Mego copyright information, the body's back is marked only by a Warner Brothers copyright.